Light Speed is a duel minigame found Mario Party 7. Its name is a play on the speed of light, also known as "light speed". 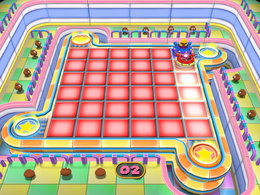 Players in their hover-cars attempt to run over the tiles to change them to their own color. There are also Warp Tiles that help players go across the areas easily. The player who has more tiles of his/her color wins. Rules – "Hop on the amazing hoverkart and run over panels to change them to your color." Advice – "Use the warp zones in the corner to quickly maneuver around the board." Nuritsubushi yūfō(UFO) Blotting Out U.F.O. This page was last edited on August 5, 2017, at 14:03.